So you fancy winning one of our Six Fabulous Christmas hampers? 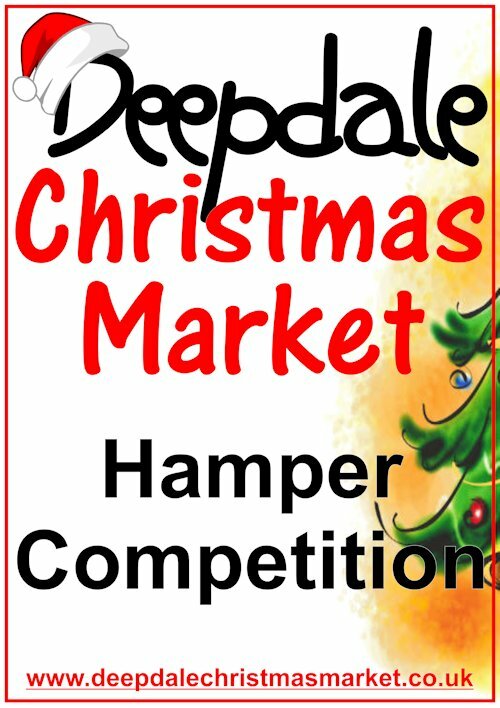 - It's very simple to enter the Deepdale Christmas Market Hamper Competition. All you need to do is fill out the form below to join our mailing list. Then we'll then select six winners from the list on Monday 2nd December 2019. The Dalegate Market shops and many of the stalls have donated wonderful items to create these six amazing hampers. Six lucky people will each win one of these hampers. The Competition closes at 5pm on Sunday 1st December 2019. You don't have to pay anything to take part in the competition, simply join the Dalegate Market Mailing List before 5pm on Sunday 1st December 2019, using the form below or enter at the Deepdale Christmas Market via one of our tablets or a paper entry. Winner will be contacted by phone and email to tell them they have won, and we'll post winners names on our social media. We had a lovely time unwrapping everything - it felt like Christmas had come early! Hamper is absolutely lovely, thank you so much, everything really appreciated. It took me back to the visit we made to Deepdale on Saturday. I love all the items and I'm sure all my family will too. Thanks again! Just a quick email to thank everyone who donated items for the Sunday hamper that I won. The hamper is wonderful and has made one very happy family. It really is appreciated, we hope to see you all at the market next year. Look at all this lovely stuff the winners of last years hampers won. We're pretty sure this years hampers will be just as good! The 2018 hampers included items from some of these stalls and shops. Hampers are best collected from Deepdale, although we can arrange delivery at winners cost if they can't visit this beautiful part of the world to pick up their hamper. To enter the competition, please fill out the form below by 5pm on Sunday 1st December 2019 and keep your fingers crossed that your name is drawn on Monday 2nd December 2019.